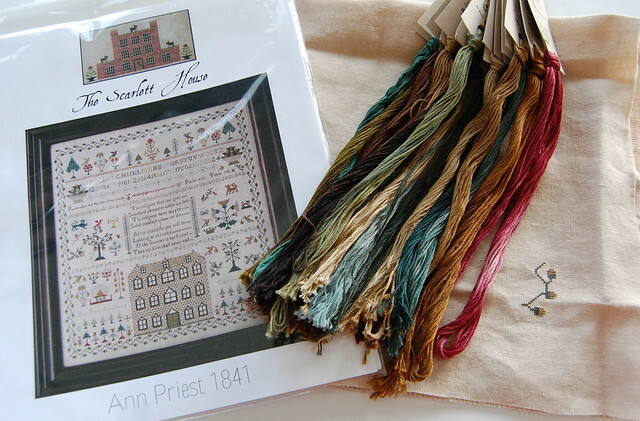 I ordered "Ann Priest 1841" from Tanya (The Scarlett House) and I received it the other day. I couldn't resist starting it right away! I love how the Gentle Art threads are looking on the Vintage Pecan Butter, which I got from Down Sunshine Lane. It's definitely one of my favorite linen colors. Das wird ein toller Sampler. Und ganz tolle Farben. The colors look great on your linen! Ah, another one of my favorites! Though I have managed not to order this one...yet! That linen color is gorgeous! Lovely start on Ann Priest, the colors look gorgeous. I love Butter Pecan too! 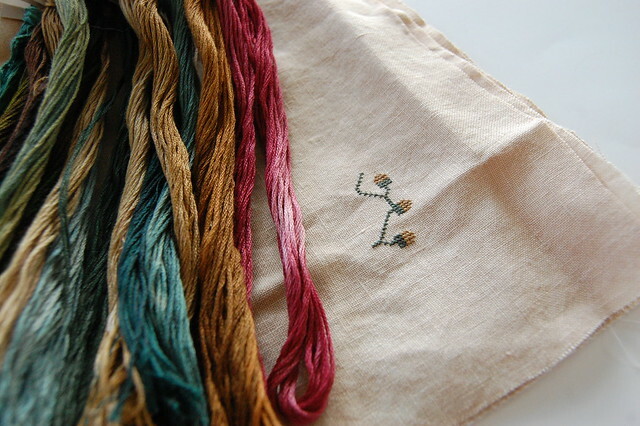 And those fiber colors look luscious against the linen! Can't wait to see more of this sampler! A beautiful project and I will really enjoy watching your progress. The colors are gorgeous! Nicole this is stunning, can't wait to see it finished! Isn't it just gorgeous!!!!! I love the colors. Fun to see yours. I started in the opposite corner. Beautiful sampler! I want to see more crosses! What a lovely new start! Your fabric looks great with those colours, looking forward to watching your progress. Great new sampler with beautiful colors. Especially love the teals...yum! Wow, so beautiful! Where can i buy the pattern?